It sure has been hot out these last few weeks! With temperatures holding steady in the 90's and above, we thought it might be a good time to talk about the dangers these temperatures hold for your pets. When I am out in the heat, my body releases sweat to help keep my body temerature down. I have to drink plenty of water and take in electrolytes and calories to replace what my body is losing. Our pets are at a greater risk of over heating. Dogs and cats are only able to sweat through the pads of their feet. They pant to help release the excess body heat. When the outside temperature is high, it is more difficult for a pet to cool down. Also, our pets don't realize they are losing hydration and, as a result, tend not to drink enough water. Most animals will also not want to eat when it is hot outside, I know I tend not to be hungry if I am too hot. The easiest solution would be to keep our pets indoors, in the air conditioning, but that is not always possible. Some homes are not equiped with a/c and some pets do not tolerate being indoors. When they are outside, make sure to provide your furry friends with shade or other shelter. A dog house in the sun can be just as hot, if not hotter, than just sitting outside. A fan can be a welcome addition to a run or kennel if you can do so safely. And don't forget those kitties! While most cats will find a shady place to rest, a beach umbrella over their favorite spot may help even more. And what about the water? Getting our pets to drink enough can be a challenge. A great idea is to take a large bucket and fill it with water. Put the bucket in the freezer! As the water freezes, float toys and chew bones and things that your dog loves inside the bucket. When it is totally frozen, it can be put in the center of a large bowl. 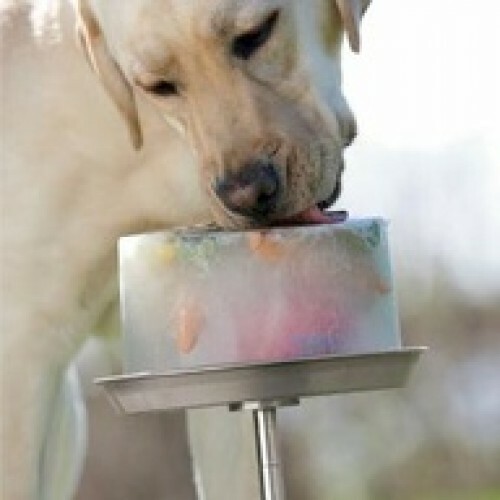 Your dog will want to get to the toys and so he will lick the block of ice! Some folks will fill a plastic kiddie pool with water, but this only works if your dog likes to swim. If your pet should become dehydrated, try offering small quantities of cool, but not super cold, water. If your pet has not had access for a while and then drinks a huge bowl of icy water, he may vomit. When placing containers of water outdoors for your pets, remember that the local wildlife may be thirsty, too! Wash bowls and buckets daily to help prevent the spread of disease and do not leave food out overnight as it may attract unwanted guests. Now, how do we get them to eat? This is a tricky one. If your pet is reluctant to eat because of the heat, try offering plain steamed white rice and a bit of steamed boneless, skinless chicken breast with no seasoning. This bland meal is a tasty treat for most dogs and will not typically upset their tummies. Traveling? We can't stress this one enough: Do not leave your pet in the car! Even with the windows down, your car can reach over 120 degrees in as little as 20 minutes. That temperature extreme can be deadly! If you must make a stop with your pet in the car, take them in with you. If that is not permitted, it may be wiser to take the time to take "Max" home first.